These aircraft equipments were introduced in 1918 and were the first types to use the new “Valve” technology. 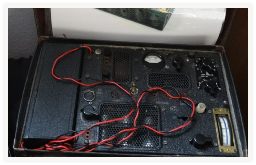 The receiver was a TRF type, (tuned radio frequency) using 3 valves and the transmitter used 2 valves in a Master Oscillator/Power Amplifier configuration The frequency of operation was MW/LW or in those days known as SW/LW as “real” short waves had not been discovered. This meant the aircraft needed to trail a suitable length of antenna. These units were the main equipments used in aircraft in the 1920s but were still in use in WW2 in some aircraft and also as pack sets in some theatres of war. 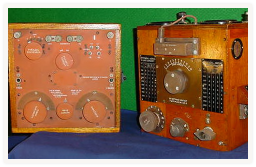 The Plessey TR9 series of aircraft transmitter/receiver units was first introduced in 1930. These were modular constuction and for the first time were totally of steel construction. 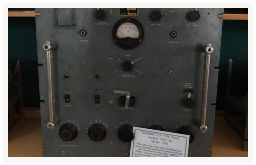 The transmitter unit was a two valve MOPA unit with an output to the antenna of about 12 watts. 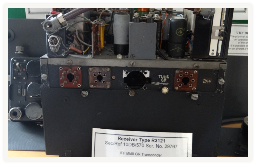 The receiver was a 6 valve TRF model with preset tuning but with a small adjustment that could be made in flight. At the start of the War, they were fitted in single seat aircraft such as Fighters but the range was poor due to the very short antenna on the aircraft. 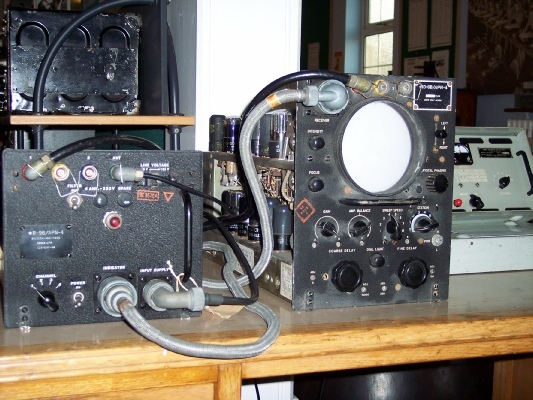 The frequency used gave a wavelength of about 60m so a quarter or half wave antenna were not possible on an aircraft such as a Spitfire. Radio cover for the Battle of Britain or the evacuation of Dunkirk was poor for this reason. Urgent steps were taken to improve this situation. 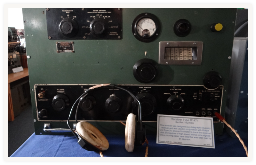 The T1154 set, together with the R1155, was designed by Marconi in 1939 and began to enter RAF service in late 1940. The T1154/R1155 combination replaced the R1082/T1083 and became the standard fit for WWII heavy bombers such as Halifax and Lancaster aircraft. Several variants were produced for different purposes such as mobile installations, High Speed Rescue Launches and ground equipments on some small diversion airfields.. 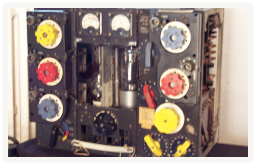 This 1930s Aircraft Transmitter, the T1083, covered the frequency bands of 136-500 kc/s (Band D), and 3-15 Mc/s (Bands A, B and C). Band changes were made using Plug-In Coil Sets. The Transmitter could transmit in CW and ICW modes on all bands, plus an R/T mode on the higher bands only. 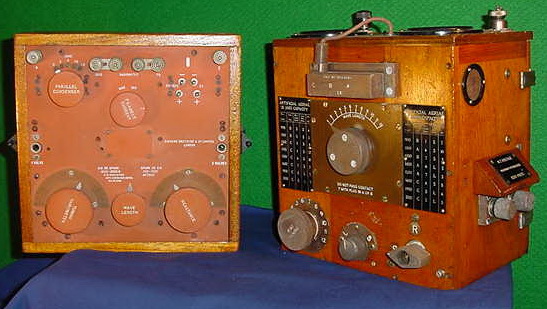 The Transmitter was used with the R1082 Receiver which was a 5 valve TRF model. These units were fitted to most aircraft in the 1930s but were used mainly as pack sets in WW2, as newer equipment replaced them in aircraft. A 12-foot Fixed Aerial was used on Bands A, B and C, with a 200-foot Trailing Aerial for Band D.
In a museum of this size, displays change from time to time as more items arrive or new projects are completed. 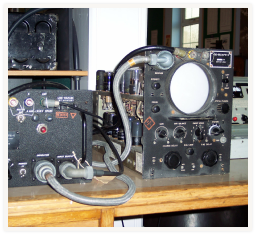 On this page, a selection of some of the more important items of our equipment are shown, but there will be a lot more to see if visiting. Donation of equipment to add to our collection are always welcome and often gifts are made as a result of a house loft clearance or turning out the garage or garden shed! 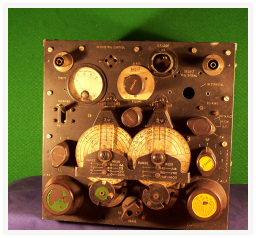 The R1116 general purpose aircraft receiver dates from the late 1930s/early 1940s. It was used with the T1115 Transmitter, in aircraft such as the Fairey Swordfish of the Fleet Air Arm. It is believed that the equipment may also have been fitted to some RAF Sunderland Flying Boats. The receiver is a Double-Superhet and has a comprehensive frequency range for its time, covering 142 to 1600 kc/s, and 2 Mc/s to 20 Mc/s.It also provides Direction Finding (DF) facilities in addition to the usual RT and CW communication. It is an 8-valve equipment, designed to run from battery supplies of 2 volts (LT), 9 volts (Grid Bias) and 120 volts High Tension (HT). The receiver is notable for using permeability tuning (as opposed to variable capacity tuning). 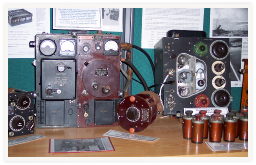 In recent years, details have been released about the work done during World War II at Station “X”, Bletchley Park. Although top secret for many years after the war, it is now known that the breaking of the German Enigma codes was very important in securing an Allied victory and this work was carried out at Station “X”. German military signals from all three services were monitored by the “Y” Service stations. These were manned by both the RAF and the Army from various locations, the nearest to Henlow being Chicksands. The display of equipment and artifacts shown here, are representative of items used at that time. The small photograph on the wall is of an actual “Y” Service room. 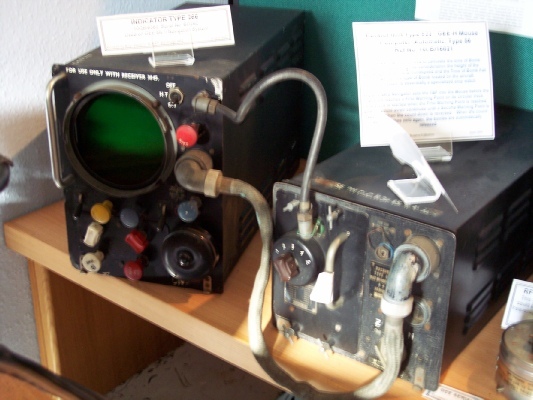 This LOng RAnge Navigation system was installed in aircraft and comprises a Receiver Unit Type R9B and an Indicator Unit Type ID6A. It was powered from the aircraft 80volt 1500c/s AC supply. To identify Allied aircraft from those of the Axis Powers, a system known as IFF, Identification Friend of Foe, was introduced. This involved sending an interrogation signal to the aircraft which if “one of ours”, would transpond with an identification code. 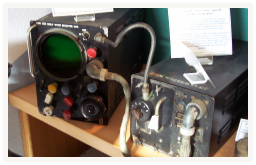 This system is similar to the system still used today to identify aircraft for Air Traffic purposes. 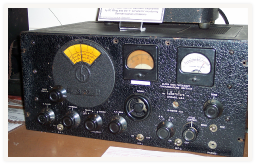 This small VHF ground transmitter, capable of an output of 5-8 watts, was developed by Marconi but uses the transmitter module, the BC625, from the SCR522 American VHF transceiver. It would have been used on diversion airfields or even mobile installations. This demonstrates thet type of innovative ideas used in WW2 to use equipments in some situations that they were not initially designed for. 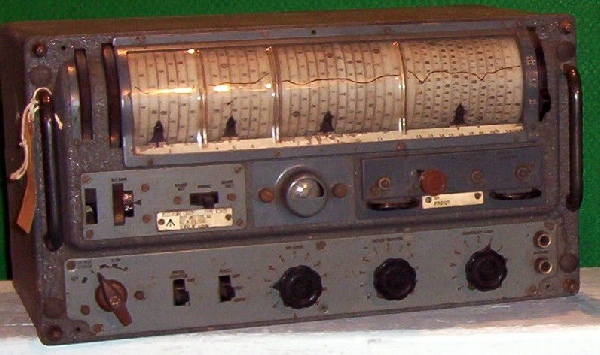 The R1475, sometimes known as Receiver Type 88, was introduced by Marcomi at the end of WW2 as a replacement communications receiver to the many American receivers in use. It was a very compact design and had a unique drum dial which effectively gave a dial length of several feey for much more accurate tuning. For servicing, it was a fairly simple matter to remove a complete stage of the receiver as it was made up of plug in modules. Main problem with this type was unreliable wafer switching between modules, but a good receiver otherwise. Stayed in use well into the 1960s often in Air Traffic rôles. 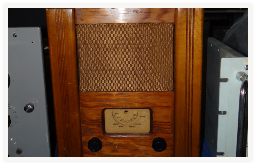 During WW2, the Government allowed one model of domestic radio to be built. Up tp 40 different manufacturing companies made these radios if they had any spare capacity and they were sold to the public for £12/3/6d (£12.17p) about 3 weeks wages at that time. 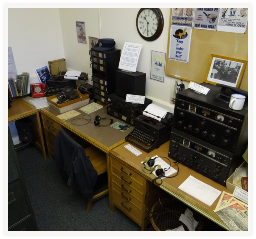 The radio works on Medium Wave only and the Museum usually has their radio playing music in the background when open. Several types of espionage radios were dropped in occupied territory for use by Resistance Units and SOE personnel. These were often built into a small suitcase for easy transportation. Many of these units were built by Polish engineers based in the UK, initially in Letchworth and later at Stanmore in Middlesex. They were often dropped to the users by parachute at night, or landed by Lysander aircraft based at RAF Tempsford. 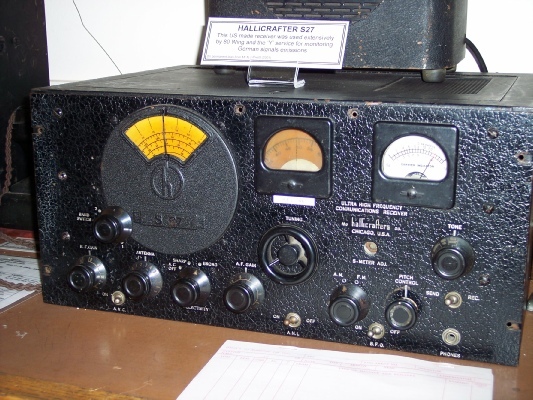 The American manufactured Hallicrafters S27 VHF Receiver was also used by the “Y” Service to monitor VHF aircraft transmissions but also to detect the Knickerbein bomber guidance system. This system, which translates as bent leg, used two VHF beams, like beam of visible light, to guide bombers to their target at the point where the beams crossed. They also monitored the direction of the later Wotan system which only used one beam but relied on the time taken for a radio signal to travel. Both systems were successfully countered by British Countermeasure methods.